Pesticides are designed to kill. They destroy that which lives off crops - the pests, the vermin - and sometimes, the farmers. Ingesting pesticide is the most common method farmers in India use to kill themselves. It is a deeply moving end - that which should enhance crop yields kills the very person it should benefit. There are many questions people have asked: why is it happening? Where is it taking place? Does the rate of suicides among farmers significantly differ from suicides in any other profession? Is it even taking place? Part of this confusion about whether a farmer suicide epidemic is taking place is down to straightforward confusion. 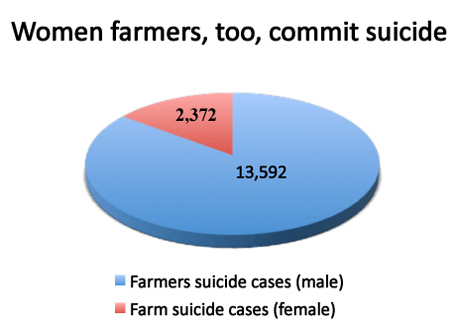 The data available does not suggest that farmer suicide is a significant category among suicides in India- there is just as many suicides in cities and across different professions. It is worth bearing this in mind. Furthermore, some commentators and analysts believe it is a myth- that it is a kind of urban rumour about rural India- the vast, empty land in which superstition and false belief still roam, land which still belongs to the old world. Indeed, some commentators have found it untenable that farmers themselves would not be better informed of the apparent causes for suicide of their colleagues and competitors- and that it is simply a prejudice against globalisation (Monsanto, the international bio-tech firm has been accused that their GM seeds are the root cause for crop failure in India), and a prejudice against this apparent old world which leads us to believe in the truth of farmer suicides. But there is reason to believe something is going on. A myriad of different reasons has been suggested for the rate of suicide among farmers: a shift from growing natural crops to genetically modified ones (which have failed in tough, dry Indian soil), a World Bank endorsed policy to deregulate the seed market in India and government insistence to grow cotton instead of food crops (where farmers found their product was not eventually competitive enough to succeed), competition from abroad in heavily subsidised and secure farming communities such as the USA, to costly genetically modified seeds which farmers have had to take loans from loansharks to purchase to insecure bank loans and funding systems. 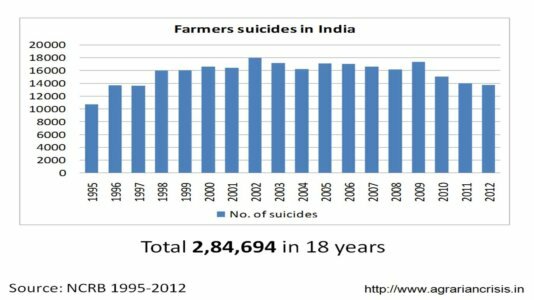 None of these reasons is sufficient to understand why farmer suicides account for a tenth of all suicides in India. The online journal Globalisation and Health offers a more holistic view. It argues that there is evidence for a suicide epidemic in impoverished rural areas of India, with farmers who grow cash crops, who own marginal or small landholdings or who have debts under particular risk from suicide. This is because, the journal argues, the transition from a regulated to a liberal economy is a threat to these farmers- insecurity and a strong network of loan sharks put pressure on individual farmers who felt they had nowhere to turn. Cash crops such as coffee are also dependent on market fluctuations. If a crop is profitable one month, there is no reason to believe it will be next month. Many farmers, according to the report, are not aware of this, and are misled by loan sharks to believe otherwise. Whatever the source of reasons for a suicide epidemic in India, there is one which has been underemphasised. That is the idea of shame. It seems strange to many commentators that crop failure alone would lead to suicide, and I agree. It is a sense of overwhelming personal failure which causes farmers to commit suicide. Typically, it is men who commit suicide- they believe they have failed in their prescribed duties as a male to provide for their families. They have not only brought shame upon themselves, they believe, but upon their families- all of their social ties are governed by complex arrangements of caste and class, and if they failed in their occupation, they believe they have failed the future of their family lines; their children will not be able to marry into respectable families, they will lose their ancestors’ farms, they will be ostracised from many social arrangements- and indeed, many farmers will believe they are personally accountable for this monumental failure. 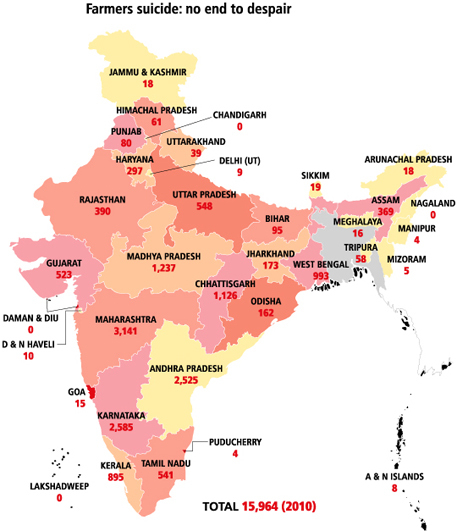 Moreover, the data about suicides in India could be skewed by the sense of shame which touches the family left behind. The cultures of rural India where suicide brings further shame onto families would mean people would not be forthcoming about suicides- many Indian cultures are not discursive about personal matters, and are intensely private about things which would cause or bring shame. This would create a cycle of not wanting to participate in studies relating to suicide- and therefore, bringing down the actual number of suicides in the data itself. I cannot personally see how the families of those farmers who have committed suicide would want to make their plight more visible. Of course, I am generalising here- but it’s an important feature in understanding the kind of thought processes which lead to suicide in India. Furthermore, it is this kind of social arrangement which makes people feel personally responsible for what appears to be structural failures. It is this point which needs to be addressed in Indian culture more than any other, I believe, to help mitigate suicides in India. Otherwise the taste of pesticide will long remain in the mouth of India’s agricultural sector. If farmers fail, they believe they have not only brought shame upon themselves, also upon their families and their future.